Here is the latest in a long line of “hundred-dollar boats” that have made their way through Pencil Brook Boatworks and into Cap’n Fowlers Navy. 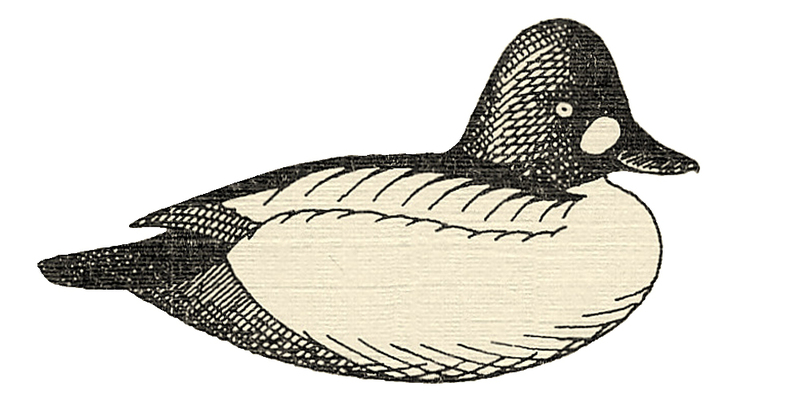 I noticed Canvasback on craigslist – just a few miles away in the Village – with that most important of attributes – an asking price of $100. 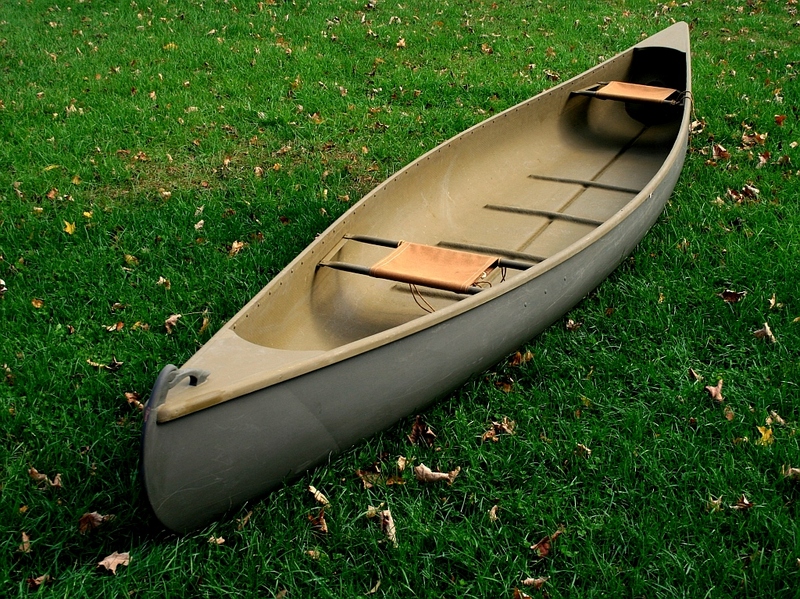 I am always in the hunt for “project boats” and, while I never mind pouring money into a vessel once I have “bonded” with her, that first date is always a cheap one. 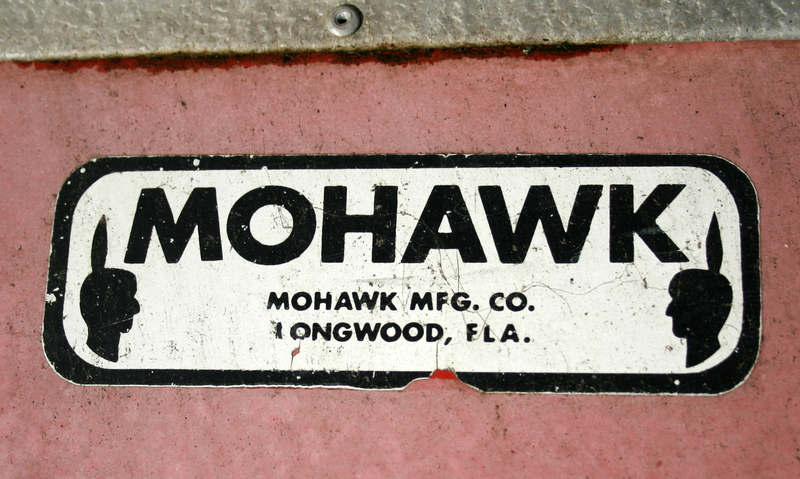 This canoe – a 16′ Mohawk built in the ’70s – caught my eye right away. First, it was ‘glass. 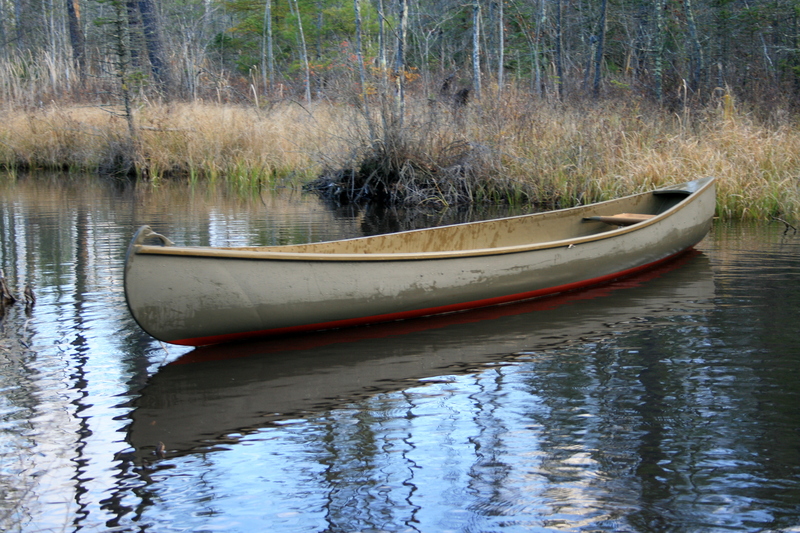 I have a couple of tin canoes and their light weight is great, but I really do not like the noise of aluminum. It was the right length and most important, the right shape. The flat bottom is a must for poling and standing and the traditional tumblehome in her topsides and bows always tugs at my heart strings. And, it needed my kind attentions. The keel was beat up with numerous patches of dubious efficacy. One of the molded thwart seats was absent. The flotation is each end was fully saturated. In a word – she was perfect! As my neighbor has observed, I would not know what to do with a “turn key” rig. I first repaired the keel. Grinding, filling, reinforcing and then a run of ‘glass tape and epoxy thickened with graphite powder. Next, the aluminum gunwales and decks came off – I drilled out well over a hundred rivets – and went to the recycling pile. I kept the aluminum frames for the seats because they were sound and provided the perfect base for the canvas seats I had in mind. The new decks were made of cypress and mated to the fore and aft bulkeads bedded with 3M 5200 so that the flotation chambers were now water and air tight. The bulkheads each got a factory inspection plate so I can stay ahead of any condensation. The new rubrails are Phillipine mahogany, fastened from the inside with SS panhead screws and set in more 5200. Their upper edges were rounded over with a router after they were installed. I suppose I would argue that my bow handle is not a mere figurehead. I try to make such “ornaments” functional as well as fun. The sleeper posture means no delicate bill will stick out to foul clothing or snap off – and, the line of the side pocket fits the hand comfortably. 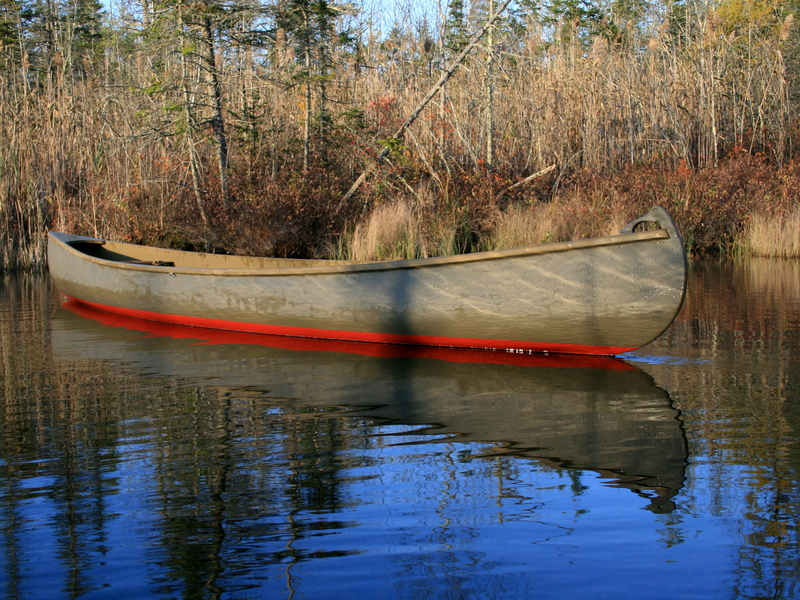 The maiden voyage and her sea trials were a complete success – both in the beaver marsh and running the river homeward. The canvas seats – laced through rows of grommets on their bottom sides – are both comfortable and sag just enough to give secure seating. 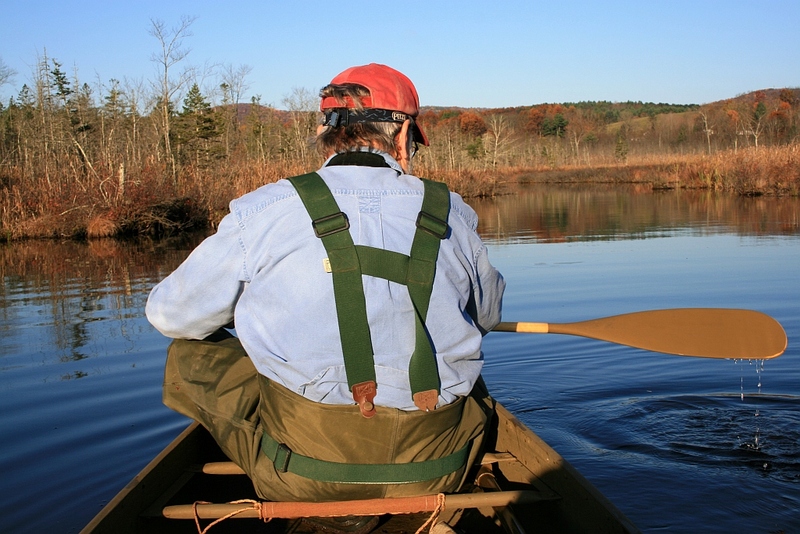 This is especially important to me because my new (2012) artificial knees preclude kneeling – which always had been my preferred posture in a canoe, especially while running rivers. I made this removable thwart for long carries. It gets lashed – with tarred decoy line – to these little cleats on the underside of the rubrails. I positioned the thwart so it would balance just right – very slightly heavier in the stern. So, what’s with that red bottom? On a duckboat, no less! 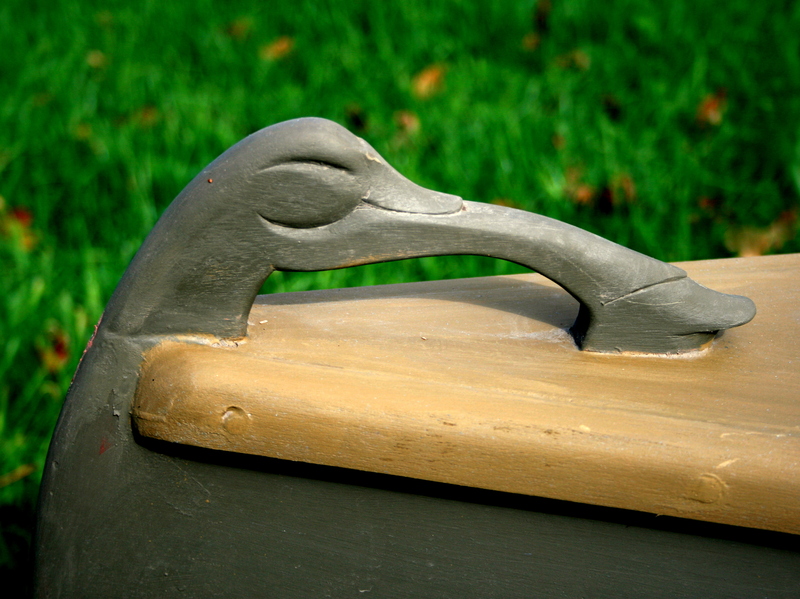 I got this idea from gunning partner Cap’n Fencepost, who painted the bottom of his pirogue red. It’s actually not traditional bottom paint – not copper-based anti-fouling red. It’s just a red primer – the red oxide intended for priming rusty steel. I prefer the color of the primer made by Valspar because it’s more red than brown. We use it because we like the way it looks – and because it is not visible under gunning conditions. 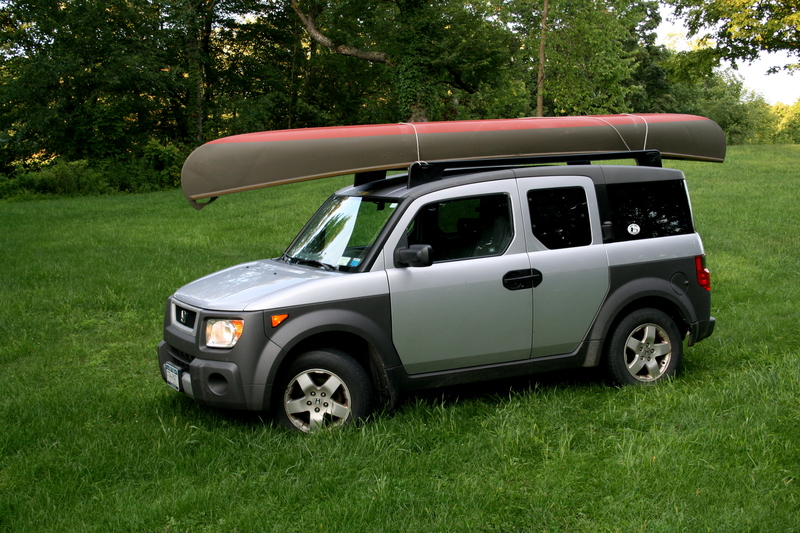 I especially like the way it looks on the roof rack – and I think any car looks better with a canoe on it.